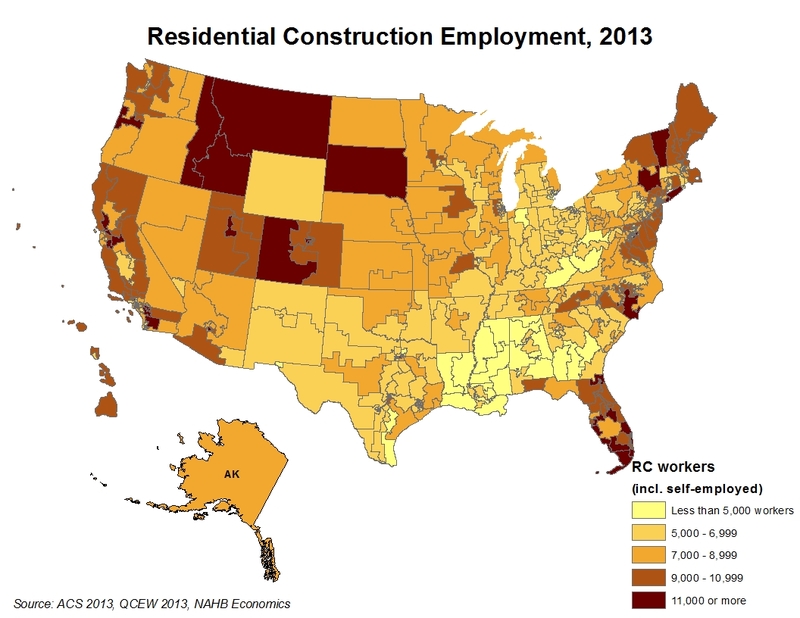 Idaho’s 1st (Rep. Raul Labrador – R) comes second with more than 15,000 employed in home building. Texas’s 29th District (Rep. Gene Green – D) that serves the eastern part of the Greater Houston area is a close third with just under 15,000 residential construction workers residing there. The top ten list also includes two districts in the state of Florida. The 9th district (Rep. Alan Grayson – D) that includes Eastern Orlando has 14,882 and the 18th (Rep. Patrick Murphy – D) in Southeastern Florida has 14,066 residential construction workers. Two districts from California also made the top ten list – the 29th district (Rep. Tony Cardenas – D) and 50th (Rep. Duncan D. Hunter – R) register 14,244 and 13,756 residents working in the home building industry. The remaining districts on the top ten list are Colorado’s 7th (Rep. Ed Perlmutter – D) and Utah’s 4th (Rep. Mia Love – R) each registering around 14,000 residential construction workers. New York’s 1st district (Rep. Lee Zeldin – R) concludes the top ten list with more than 13,000 home building workers residing there. By design, Congressional districts are drawn to represent roughly the same number of people. So generally, large numbers of residential construction workers translate into high shares of RC workers in their district employed labor forces. The 29th District of Texas has the highest share of residential construction workers in its employed labor force, 4.8 percent. Florida’s 18th and 19th Districts are close behind with 4.7 and 4.5 percent. The new NAHB home building employment estimates only include workers directly employed by the industry and do not count additional jobs created through the ripple effect when building material suppliers, furniture producers, landscaping and other dependent industries hire workers in response to shifting demand for their products and services triggered by residential construction. As a result, the estimates underestimate the overall impact of home building on local employment.